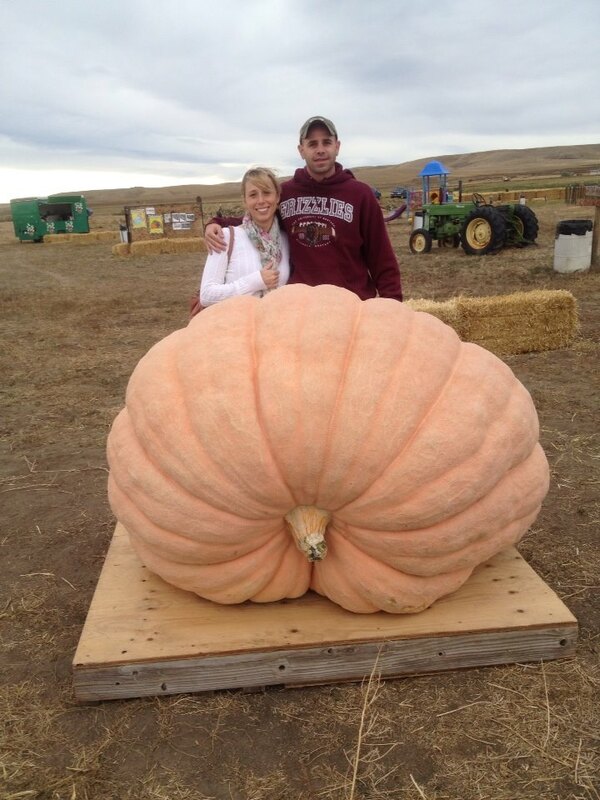 Weekend adventure: The Great Pumpkin is in our midst! Naturally, I was mesmerized from the get-go. Despite his initial lack of enthusiasm, Zach suggested we take a day trip up to Shelby, which is a little more than an hour north of Great Falls, to see the G.P. So we hopped in the car Saturday afternoon, ready for a little adventure. We got to Shelby, parked, and realized we should probably find out just where in town this G.P. was located. We looked it up and found out it was reportedly stationed at Shelby Paint and Hardware. Then, in a quintessential small-town moment, we looked up from the phone to realize we were right across the street from it. 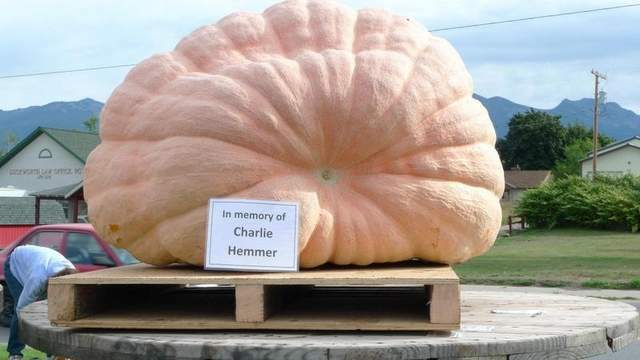 We went inside and asked an employee where we could see the Great Pumpkin. Much to our dismay, she informed us that the G.P. had already been purchased and transported to another small town that’s actually only 10 minutes from Great Falls, instead of 75. 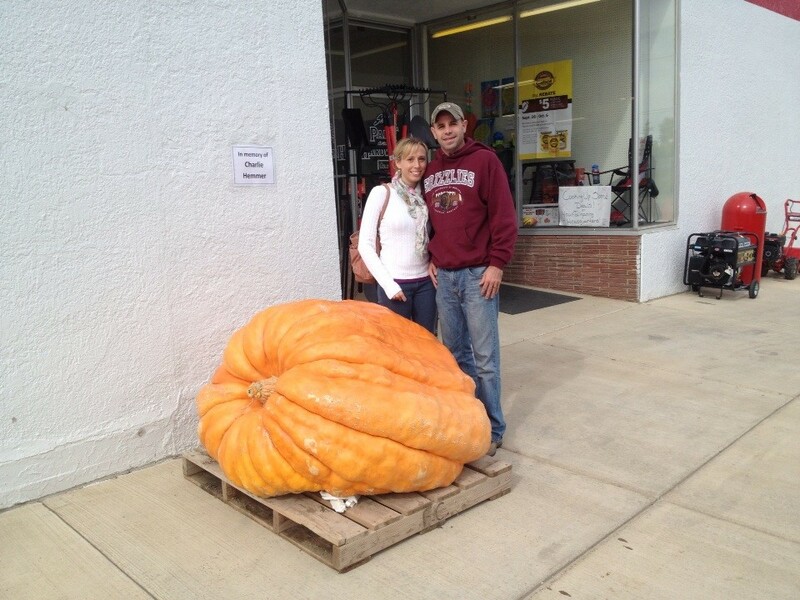 But, we were in luck, because there was ANOTHER GIANT PUMPKIN outside. 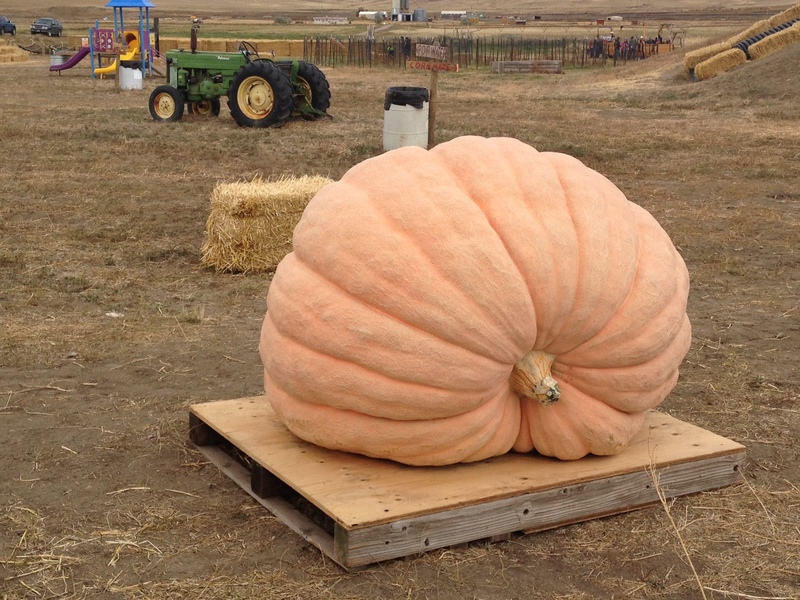 This one only weighed about 800 pounds, compared to nearly 1,200 for the actual G.P., but it was still larger than your average gourd. Still pretty big, though it looked kind of smooshed. 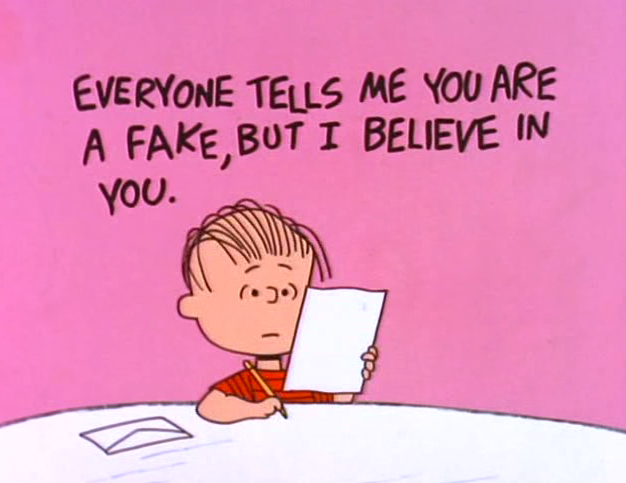 We weren’t going to settle for second place though, not after dreaming of meeting the Great Pumpkin for three entire days. After a quick stop at the Oasis, a little dive bar next to the hardware store that had an unusual combination of dead animal heads and ladies’ undergarments hanging on the walls, we started back down I-15 to Vaughn, the G.P.’s new residence. About an hour later, we reached the corn maze to which the Great Pumpkin had been sold. We quickly realized we were the oldest people there without kids, and that they wanted us to pay $16 to enter. The lady at the entrance was kind enough to let us go in without paying when she found out we just wanted to a few moments to take in the Great Pumpkin’s magnificence. Since there’s really not much you can do with a giant pumpkin other than get a few pictures taken with it, we left about five minutes later. We thought we had wrapped up our giant-fruit encounters for the day. Boy, were we wrong. Pleasantly, pleasantly wrong. On our way home, we stopped off at Albertsons to get some dinner ingredients. And, much to our delight (while, mine, at least), we spotted … HIM. 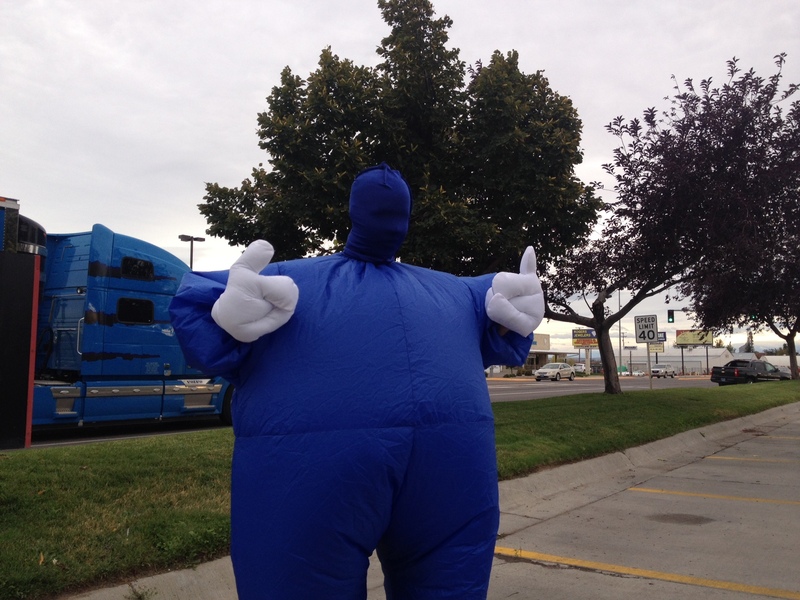 An employee at a Spirit Halloween Store, he stood on the sidewalk next to a busy street, dressed up like a giant blueberry, hoping to lure customers into the nearby store with his dance moves and blueberry-ing. Well, that’s what he said when we pulled up next to him, and I shouted “Hey, what’s your deal?” out the window. In the end, it took us about two hours longer than we needed, and we drove 150 miles out of our way, but our adventure to find the Great Pumpkin was worth it. Linus would be proud.